Sensationalising the story of Saltaire for entertainment value may be good fun, but it's important to remember that Saltaire is a World Heritage Site and its history is important. Authenticity is vital. Anyone who values true history should ask how stories have been evidenced and sourced. The constant repetition of manufactured stories and myths can serve to authenticate them which, basically, corrupts the true story of Saltaire and its people. If sources can be provided or are discovered, this website will, of course, make the appropriate correction. The story of Saltaire is fascinating and is still unfolding. We welcome and value contributions. Albert Road was built in 1866 and as you can see from information taken from 1871 census, there was no hierarchy as to the occupants. 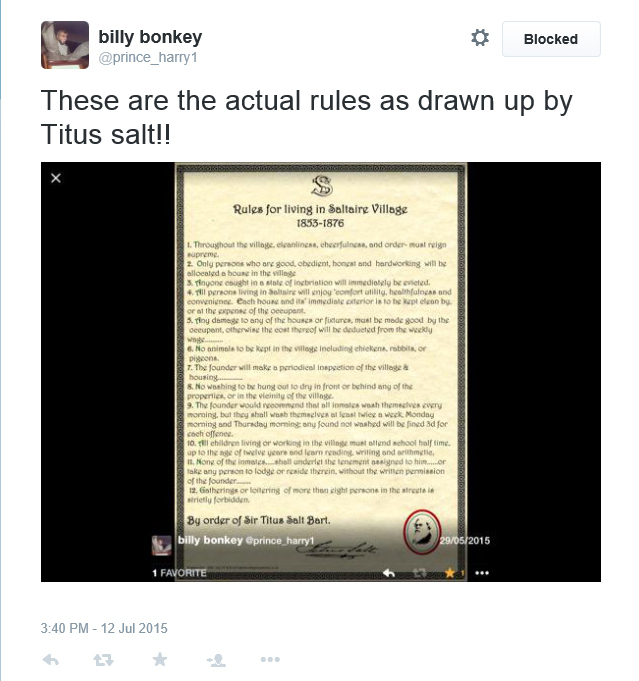 Question: Are there genuine surviving rules of Saltaire Village from Sir Titus Salt's time? Answer: For the Almshouses and Park, yes. There are also Sir Titus Salt Hospital Byelaws, dated 1st July 1910 (revised May 1922), which are genuine. However, rules produced by a commercial company relating the the Village and the Mill known as "Rules for Living in Saltaire Village, 1853 - 1876", and "Rules to be observed by the hands employed in Salts Mill, 1853 - 1876" and for sale in the Saltaire Visitors' Information Centre, are not "official" or "authentic." They were produced by a local man, Clive Woods in c2002 for the purpose of being sold to tourists. Twitter post by Maria Glot of Salts Walks: "#Saltaire mysteries, Daisy, Fern & Myrtle. In service to Sir Titus or at his service? Find out only on a Salts Walk"
It's no mystery. There is no evidence to show these streets are named after women or that maids bearing the names of Daisy, Fern and Myrtle served the Salt household. 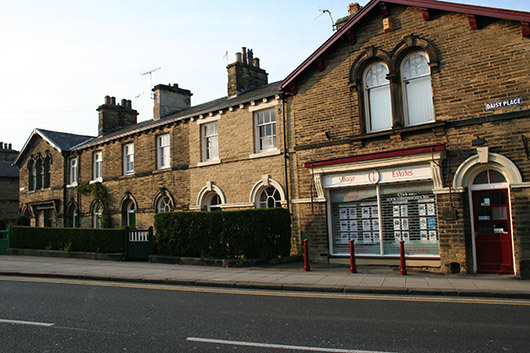 The streets of Saltaire are named after Sir Titus Salt's children, extended family (daughters-in-law), Queen Victoria and Prince Albert, Upper and Lower School Street (self explanatory), and the architects Lockwood and Mawson. There are also three streets which bear the names of popular Victorian plants: daisy, fern and myrtle. No evidence has been found to show that Sir Titus Salt had anything other than a loyal and faithful relationship with his wife, Caroline. No evidence has been found to support this story. It's been suggested that Higher School Street and Lower School Street were to be named after Sir Titus Salt's parents, Daniel and Grace, but that Titus quarrelled with them and changed his mind. 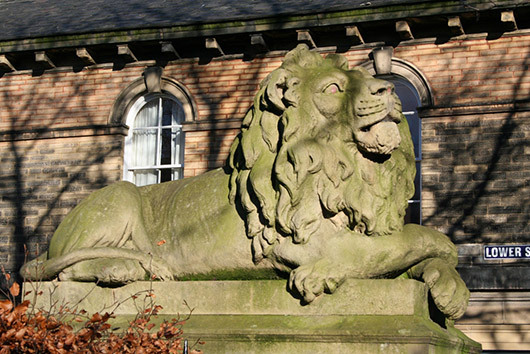 Saltaire lion, adjacent to Lower School Street. 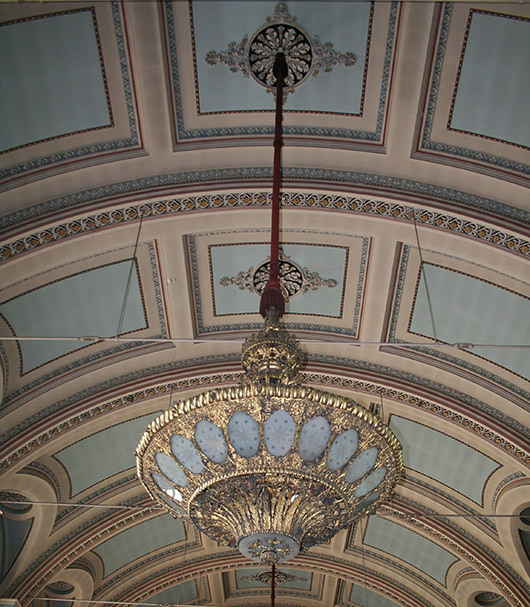 An often repeated story is that Sir Titus Salt placed the chandeliers to deliberately obscure the view from the United Reformed Church balcony, (formerly the Congregational Church) to spite his wife, Caroline, who, it is said, wanted to sit separately from other worshippers. This theory was put forward by the late Clive Woods in his book, Saltaire History & Regeneration, published 2000. An alternative opinion is this is highly unlikely: the staircase to the balcony is narrow and twisting, completely unsuitable for a woman, often pregnant and wearing voluminous Victorian clothing, to navigate. The Salt family never lived in Saltaire and often worshipped elsewhere. There is documented evidence of the close and affectionate relationship between Sir Titus and his wife, Caroline in the biography written by his contemporary, the Rev. Robert Balgarnie (republished by Nemine Juvante (Saltaire) Publications (20 Sep 2003) ISBN: 0954584007. Caroline Salt was adept at hosting parties for the workers, which were hosted in the grounds of her Lightcliffe home. She also attended the opening of Salts Mill, a grand affair, on 20 September 1853, when she was eight months pregnant, which does not denote an attitude of separation from the mill workers. MYTH: The bust in the church was placed to aggrandise Sir Titus Salt in his lifetime. This is incorrect. 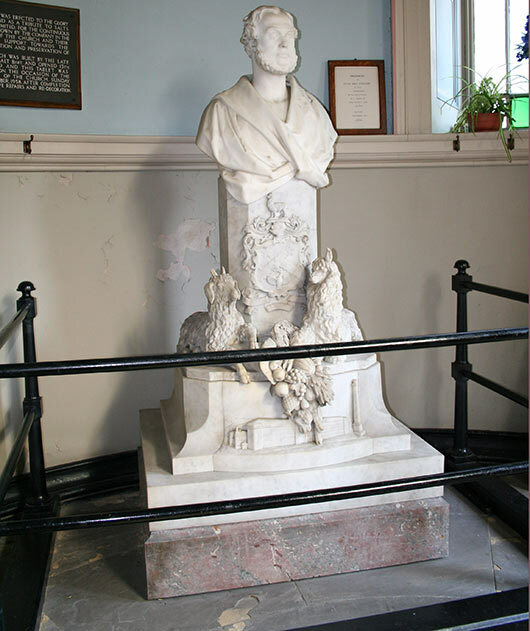 Below, is the bust of Sir Titus Salt, gifted to him by his workers. It stood in the foyer of his home, Crow Nest, Lightcliffe. In his will he requested that it should be placed in a public institution and so, after his death, it found its way to the Saltaire Congregation Church (now the URC) where Sir Titus Salt is interred in the mausoleum with other family members. It was not placed there by Sir Titus Salt in his lifetime for the purpose of aggrandising his status. The bust of Sir Titus, which was moved into the church after his death. No evidence has been found to support this story that red-headed girls were asked to urinate separately. MYTH: Sir Titus Salt destroyed the records of Salts Mill to hide his "ruthlessness"
No evidence has been found to support this. It was said in a published article that Titus Salt destroyed the paperwork of Salts Mill to hide his ruthlessness. Titus Salt died in December 1876. Salts Mill continued to operate under the Salt family name until 1892, when it went into administration. Records didn't survive. Why records didn't survive - no evidence has been found, to date. MYTH: The blocked up windows of Saltaire were due to the glass tax. Work began on Saltaire in 1851 and Salts Mill, the first building to be completed, was opened in September 1853. The glass tax was abolished by Sir Robert Peel's government in 1845.